Restaurateur Jamie Lim from Joo Bar is home chef Elton Seah’s customer, so when the opportunity arises, when the shop beside Joo Bar is vacant, they collaborate to bring HolyCrab to Tan Quee Lan Street. 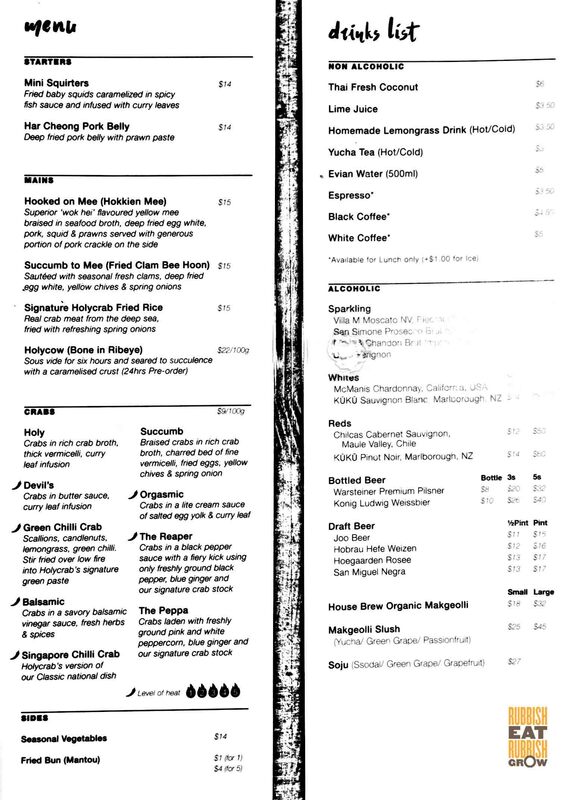 Most of the mains are crab dishes except for bone-in ribeye ($22/100g) which requires pre-order a day in advance. The sauces and broths are homemade from scratch. No MSG in the food. There is no starch added to the thick sauces. All crab dishes use Sri Lankan crabs weighting at least 900g each. They are sold at a fixed price of $9/100g. They receive live crabs daily to ensure freshness. The traditional white pepper crab is given a twist in The Peppa by mixing in pink peppercorns. It’s fried in butter and crab stock. The sauce has permeated into the crab but doesn’t overpower it; it’s sweet and tingly spicy. The Green Chilli Crab is created as a counterpart to Singapore red chilli crab (which is also available here). The sauce is made from homemade rempah with two green chillis, kaffir lime leaves, lemongrass, ginger, candlenut, and onion. It tastes like Thai green curry without coconut sauce. Out of the four crabs, my least favorite is this balsamic crab. (Our favorites are the Peppa and the Devil’s Crabs.) It is inspired by hairy crabs with vinegar. Here, the crab is soaked in a sauce of balsamic vinegar, red chilli, and curry leaves. It’s sour and sweet. It is not terrible, but it’s strange and gets some getting used to. If you like balsamic vinaigrette–which I don’t–then you may like this. In addition to crabs and beef, they serve carbs including their signature fried rice ($15). We tried two noodles dishes: the fried clam bee hoon ($15, above) and Hokkien mee ($15, above). The former is in a crab broth which is flower crabs simmered for 5 hours with peppercorns and lemongrass. The Hokkien mee with homemade crispy pork lard is the unanimously rated the better one between the two. The Hokkien mee is different from elsewhere’s; it’s savory without sweetness whereas usually Hokkien mee is savory-sweet. Although I’ve paid for $32 at Po Restaurant and $48 at Sky on 57 for Hokkien Mee, I don’t know if I’ll pay $15 for this Hokkien mee; it’s good and clean but it’s 5 times the usual price. The Hokkien mee is indicative of my overall experience at Holy Crab. The food is slightly pricey but it’s delicious and clean. After eating, we didn’t feel heavy. –New Ubin Seafood, Sin Ming: How I Spent $80 on Cze Char. Ouch. I don’t think your “five times the usual price” comment is very fair. First of all, it is actually quite hard to find Hokkien mee for 3$ nowadays. And any basic Hokkien mee is mostly starch. The version pictured is clearly full of liao. Not cheap liao at that.